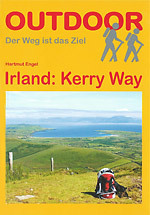 This detailed pocket guide to the Kerry Way is written in German. It is a very useful resource for planning the walk with extensive contact details and website addresses for every kind of business and service relevant to the trail. The first half of the book examines the flora, fauna, history, geography and climate conditions of the region. There is plenty of practical information to assist in researching transport and accommodation as well as highlighting other popular activities available to compliment a walking holiday. 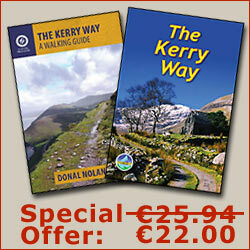 The second half of the book looks at the Kerry Way itself with a stage by stage account of the walk. Each section has a small map that is accompanied by a graph depicting the altitude profile. There are descriptions of the points of interest along the trail in addition to details of other local attractions worth visiting. 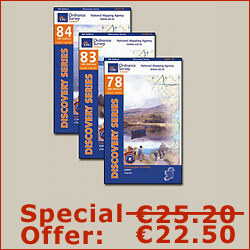 There are many colour photographs throughout the book which help convey the beauty of County Kerry.